10in x 12in x.025 metal with four mounting holes. The most famous steam locomotive in the USA, the Southern Pacific Railroads streamlined 4-8-4 Daylight. 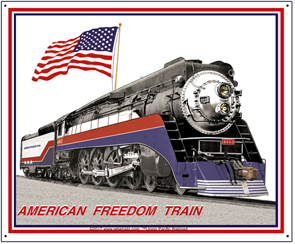 She served as the American Freedom Train in 1976, touring American during its Bicentennial. Click on above image for zoom.